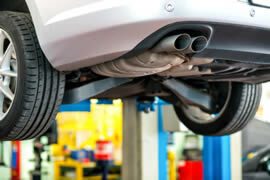 Make sure that your vehicle follows state regulations for emissions. Failed the state emissions test again? Emissions repairs are our specialty. We will perform a full diagnostic and call you with a quote. After we complete repairs on your car we guarantee that your car will pass emissions, because we take your car in for its next emission test. We have the right equipment. We have the right diagnostic tools to determine the cause of the increased emissions and the know-how to fix the problem. Our technicians are ASE certified on the best practices to solve your emissions problem efficiently.